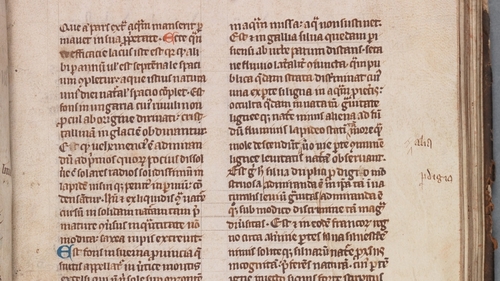 "A word bantráill, explained as "female slave", is probably a combination of Irish ban- "female" and Old Norse þræll "slave""
It’s not often that medieval Irish manuscripts make the news - and it's all the more unusual when they feature on Dutch national media. Last October, the Dutch national newspaper NRC Handelsblad carried a report that a new word of Old Dutch had been discovered in an Irish manuscript. But how was this discovery made? What was the Irish manuscript in question? Did it really contain Old Dutch? And how would Irish scribes have been aware of, or even interested in, that language? The story has its origins in PhD research carried out at the University of Leiden by Peter-Alexander Kerkhof. He published some of his ideas on a blog dedicated to Dutch studies, where he cited an early Irish text known as "O’Mulconry’s Glossary". This is found in a manuscript in Trinity College, Dublin, dating from 1572, now bound as part of the Yellow Book of Lecan. The name "O’Mulconry’s Glossary" was assigned by the great (and often controversial) Celticist Whitley Stokes (1830–1901), although the text’s title is really De origine scoticae linguae ("On the origin of the Irish language"). Despite being copied into a 16th-century manuscript, the language is very ancient and coherent with Irish of the early eighth or possibly even seventh century, putting it among the earliest compositions in the Irish language. De origine scoticae linguae does exactly what it purports to. After a remarkable prologue which claims that the Irish language derives from Hebrew, Latin and Greek (and that the Irish people are descended from Greeks! ), it discusses the origins of about 880 mostly Irish words, deriving them from Latin, Greek, and Hebrew, as well as Welsh and Norse. Modern scholars would not now accept most of these derivations, but nonetheless this represents one of the earliest milestones in the study of the Irish language and the beginnings of Celtic linguistics. Entry number 183 in De origine scoticae linguae reads Blinnauga .i. dallsúilech in linga galleorum "Blinnauga, i.e. blind-eyed, in the language of the Gall." Kerkhof took the Latin word galleorum to refer to the Gauls, whose territory in ancient times extended as far north as the Rhine, and whose population included some Germanic speakers. The first part of the glossary headword, Blinn-, certainly corresponds to the Germanic word blind, explained as dall in Irish (nn and nd are frequently interchanged in Irish manuscripts). Kerkhof took -auga as an error for Old Dutch augo "eye" (referenced by Irish -súilech "-eyed" in the text), and reasoned that some early Dutch speakers must have come to Ireland as exchange students to study in its famous monastic schools. The language is very ancient and coherent with Irish of the early eighth or possibly even seventh century, putting it among the earliest compositions in the Irish language. But there is another explanation. Gall in Irish can mean "foreigner" and especially "Scandinavian" (as in the place name Fingall). The term galleorum might therefore equally be a Hiberno-Latin hybrid, referring instead to the Old Norse language. This alternative is more congruent for several reasons. Firstly, language contacts between the Norse and the native Irish are very well documented. Indeed, many Irish words in current use were borrowed from Norse, particularly within those domains in which the Scandinavians excelled: for example, bád "boat" (Old Norse bátr), ancaire "anchor" (ON akkeri), stiúir "rudder" (ON stýri), trosc "cod" (ON þorskr) and margadh "market" (ON markaðr). Secondly, other Norse words crop up in the same glossary. For example, in entry 100, two curious words eist and or are explained as "horse" and "hair" respectively, probably borrowings from ON hestr and hór. In entry 265, a word bantráill, explained as "female slave", is probably a combination of Irish ban- "female" and ON þræll "slave", the latter no doubt another specialist commodity of Norse traders (compare the English word enthralled). Finally, auga does not need any correction as it is already a perfectly good Old Norse word. We find it elsewhere in similar compounds, for example vindauga "wind-eye", borrowed into Irish as fuinneóg and into English as window. The earliest recorded alliance between Irish and Norse was in 850, so we must assume that by then both groups were at least on talking terms. Recent research by this author has shown that the parts of the glossary in which all of these Norse words occur make up a latter addition to the original text, inserted in the late-ninth or early-tenth century. The term Blindauga sounds like a Scandinavian nickname, like that of Thorsteinn Krókauga "hook-eye" or Sigurðr Kýrauga "cow-eye" (both noted by Peter Schrijver). Who Blind-eye might have been is unknown, but we owe the survival of his name today to the interest of an early Irish linguist. Dr Pádraic Moran is a lecturer in Classics at the National University of Ireland, Galway. He is a former Irish Research Council awardee.